Within the Middle East’s Jenga-like geopolitical structure, Pakistan remains an integral yet enigmatic piece. When Americans think about Pakistan, there is a tendency to think of things on a day-to-day level. The following questions arise: Has it reopened the supply road so that American troops can get resupplied in Afghanistan? Has the military government been more cooperative? Has the military been more cooperative? Has the civilian government become less corrupt? Recently, Secretary of State Hillary Rodham Clinton issued an apology to Pakistan, hoping both nations sign an agreement that regulates the flow of NATO troop supplies in and out of Afghanistan. The pact stems from a seven-month blockade Pakistan imposed on the United States following American airstrikes that killed 24 Pakistani soldiers on the Afghan border. The Pakistani position is that the U.S. is not respecting its sovereignty. The U.S. position is that the Pakistani government is, in various ways, not respecting American sovereignty, such as by attacking American soldiers and allowing terrorists to operate out of its territory. Zakaria said the U.S. government has been trying to create a relationship more about the Pakistani people than about support for the country’s government. The Kerry-Lugar Act gives a great deal of aid — billions of dollars — to Pakistan. The money is meant to go directly to the Pakistani civil society and to strengthen that civil society, and democracy, instead of Pakistan’s military. Many of the groups, which Pakistan has supported, have turned around and bitten the hand that fed them. There are varying perspectives on how Pakistan should handle internal terrorist groups. But one thing is for certain, Zakaria said. Those groups endanger Pakistan, any neighboring countries, and Western influences, such as the U.S.
Pakistan has had nuclear weapons for the last 40 years. So, if anyone had to worry about the dangers of nuclear proliferation, at any dimension, Pakistan is a much more worrying prospect than Iran. “Right now, we are in a sense hostage, because we need them for Afghanistan,” Zakaria said about the United States relationship with Pakistan. 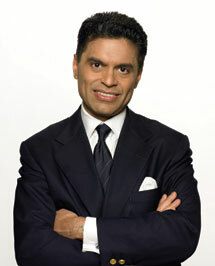 But Fareed Zakaria hopes the United States’ reliance on Pakistan changes, which would limit Pakistan’s leverage. “I think it fundamentally helps the United States to be able to be more nimble and less dependant on some of these regional countries,” he said.